Xiaomi Mi 8 is just days away from an official unveil, and the company has now confirmed it will indeed be powered by the Qualcomm Snapdragon 845 SoC, as expected. 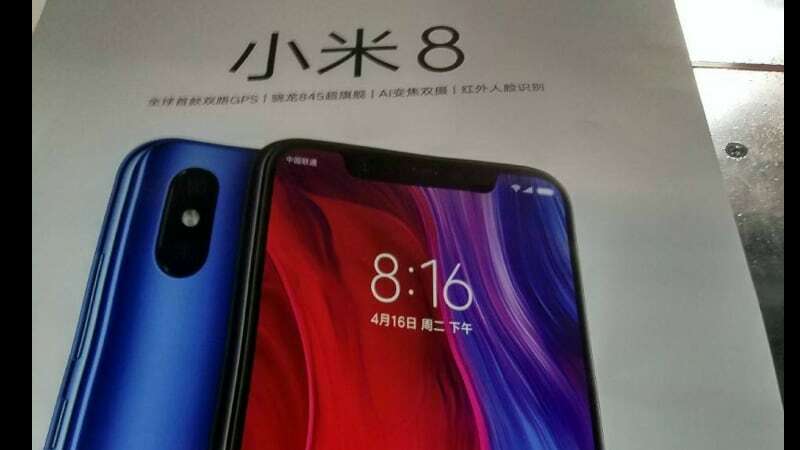 Separately, despite the impending launch, Mi 8 leaks refuse to die. New information gives us a sneak peek at what the retail box will look like while also revealing specification details of the smartphone. Furthermore, Qualcomm reportedly leaked out that the Mi 8 will support the latest Quick Charge 4.0+ fast charging standard. Let’s start with the confirmation of the Snapdragon 845 SoC on the Xiaomi Mi 8. Xiaomi Global Spokesperson Donovan Sung on Monday revealed the use of Qualcomm’s top-end mobile SoC in a [tweet]. “We’re excited to announce that #Mi8 will use the Snapdragon 845 processor! This is a truly flagship processor, suitable for a truly flagship phone. More details on May 31!” Sung said. The retail box images have been leaked on Slash Leaks, and the black box has a big 8 plastered in the front. At the back, there’s not much print either, but some specifications of the Mi 8 are listed. The Xiaomi Mi 8 is listed to be powered by the Snapdragon 845 processor paired with 6GB RAM. Internal storage is at 64GB, and the smartphone is also listed to support dual-GPS mode. Not sure why that’s a big deal but we will know soon enough. One of the sensors at the back will sport a 20-megapixel lens. The in-box accessories include a USB Type-C cable and a USB Type-C to 3.5mm audio adapter. This could mean that the Mi 8 will also not support a 3.5mm audio jack just like its predecessor. Separately, there is also a poster leak on SlashLeaks showing the front and back of the Mi 8. The smartphone is seen sporting a notch display, a vertical dual camera setup, and chamfered edges. The poster also reconfirms the dual-GPS support, Snapdragon 845 SoC, and the vertical dual camera setup with AI capabilities. The poster also claims that the smartphone will come with 3D Infrared facial recognition as well. Furthermore, Qualcomm is said to have confirmed that the Mi 8 will support its latest Quick Charge 4.0+ technology. The company has reportedly updated its official page, according to Mydrivers, to reflect Mi 8 as one of the supported devices. Notably, the Mi 8 listing on the Quick Charge 4.0+ devices page is no longer present, and appears to have been removed in the interim. The latest Qualcomm tech claims to charge 50 percent of the smartphone in 15 minutes. The Xiaomi Mi 8 is set to launch on May 31, and the anniversary edition phone is expected to come with under display fingerprint scanner, and come in different RAM/storage variants. It is tipped to feature a 6.2-inch full-HD (1080×2280 pixels) display with an 19:9 aspect ratio. The dual rear camera setup will come with a 20-megapixel primary sensor, featuring an f/1.7 aperture, and a 16-megapixel secondary sensor along with an f/2.0 aperture. On the front, a 16-megapixel camera sensor along with an f/2.0 aperture is expected. The smartphone also seems to have 6GB of RAM and 128GB of onboard storage. However, some other reports claim that an 8GB RAM variant also exists. It has also been reported that the Mi 8 will pack a 3300mAh battery and will come with 7.8mm of thickness as well as 172 grams of weight. Xiaomi may use a glass back panel to enable wireless charging support. The Xiaomi Mi 8 rumoured starting price is at CNY 2,999 (approximately Rs. 32,000).